Got the sides built for the stand. There’s a HUGE sound difference. I tried to get a video of the difference, but I’m not sure how well it truly comes across. I’ve also found a few more hitchhikers in the rocks. There’s a rather large bristle worm crawling around and some Asterina starfish. 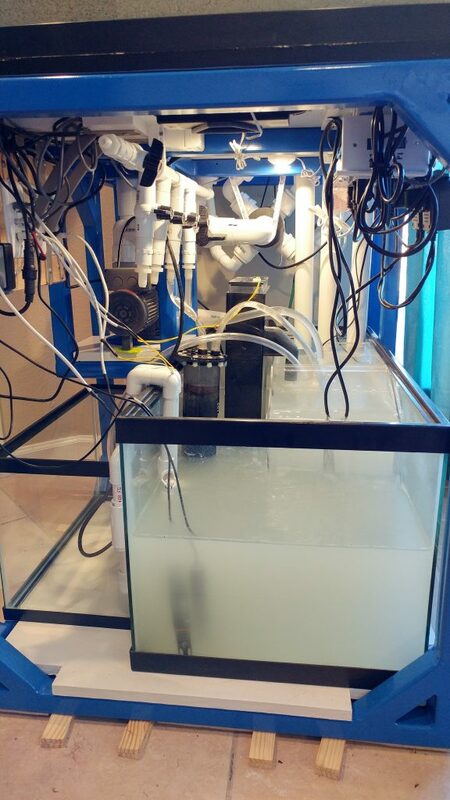 Lastly I got the wave maker cleaned up so it’s working now, and I started killing Aptasia. I brought over most of the Live rock that I purchased in the beginning of this whole ordeal. We left one big rock at my friend’s house so that we didn’t completely deplete all of his bacteria load. 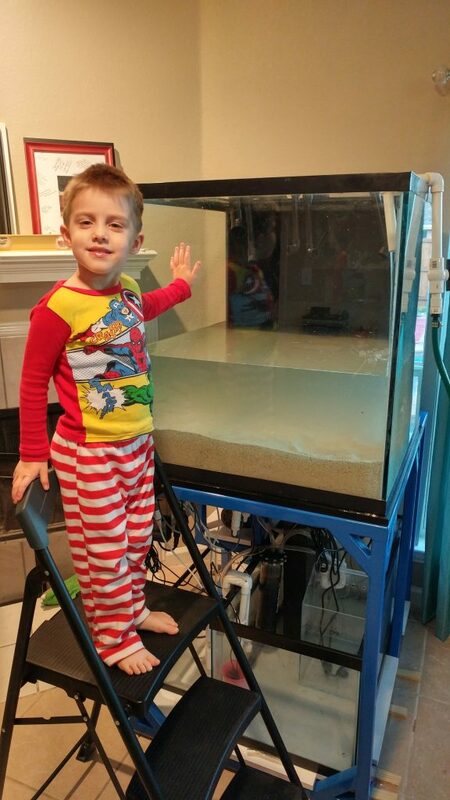 Within a few hours, you could already see that the silt in the water was starting to settle and by this morning you could almost see all the way through the tank. I can already see that there is some aptasia on the rock, so I’ll be spending some time in the coming weeks trying to get rid of it. I ordered a set of Salifert test kits to measure all of these. They’ll be in next Tuesday. 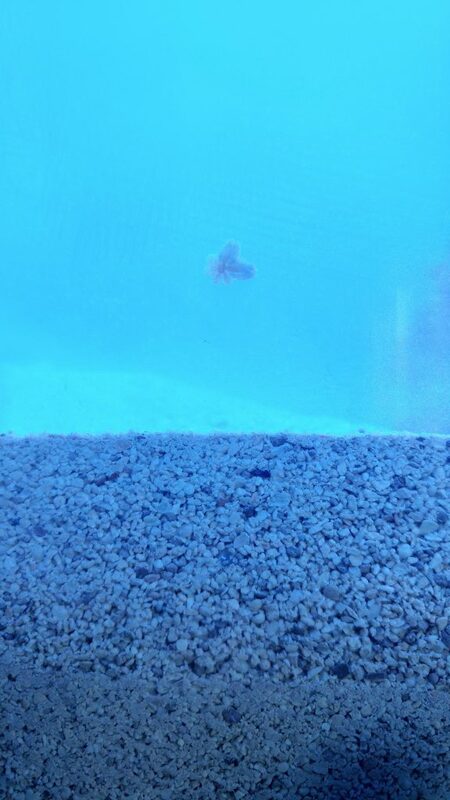 I’ll miss out on testing during the first week of tank cycle, but with the live rock being fully cured, I wouldn’t expect much of a cycle. 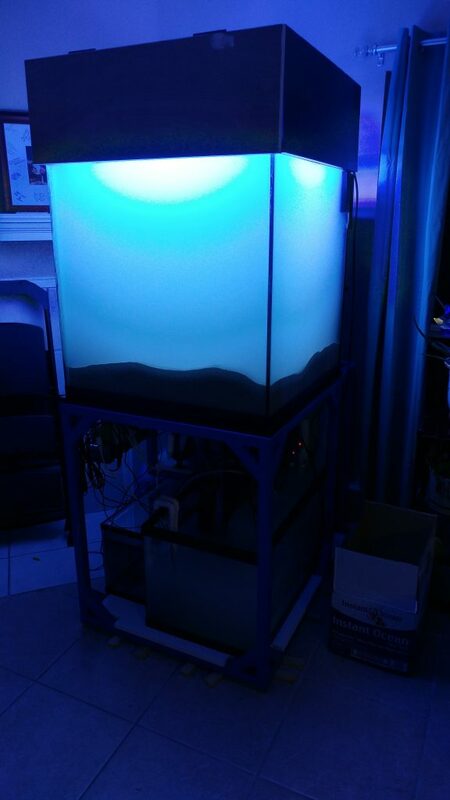 It took two days of making water and three batches of adding salt, but the tank is full! I also wiped out all the old data in the database, so the logs will only show actual reef data. Lastly, I did a lot of little projects that needed to be done. I made a lid for the top-off tank, got more paint on the canopy, installed the cabinet lighting, and cleaned up the rest of the wiring. 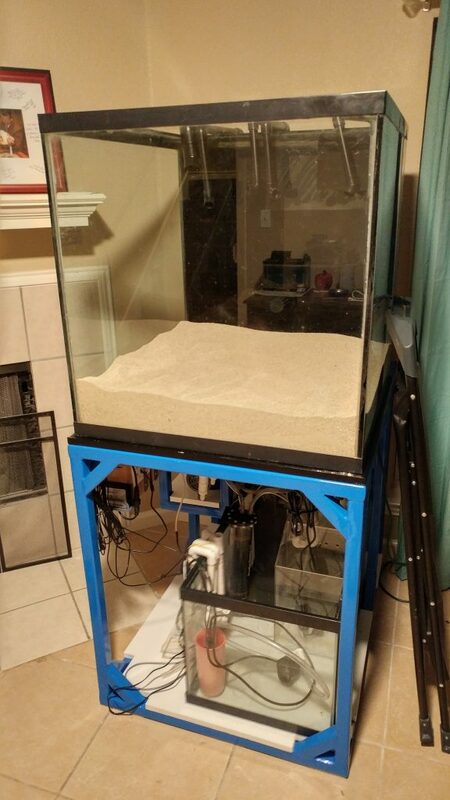 Unfortunately, I completely forgot to clean the sand before putting it in the tank. Well, that’s not 100% true… I remembered after I was half way through putting the sand in the tank and decided to just keep going. I’ll need to read up on ways of cleaning out the sand. I’m thinking of filling my second reactor with cotton balls and seeing if that will help filter it all out. 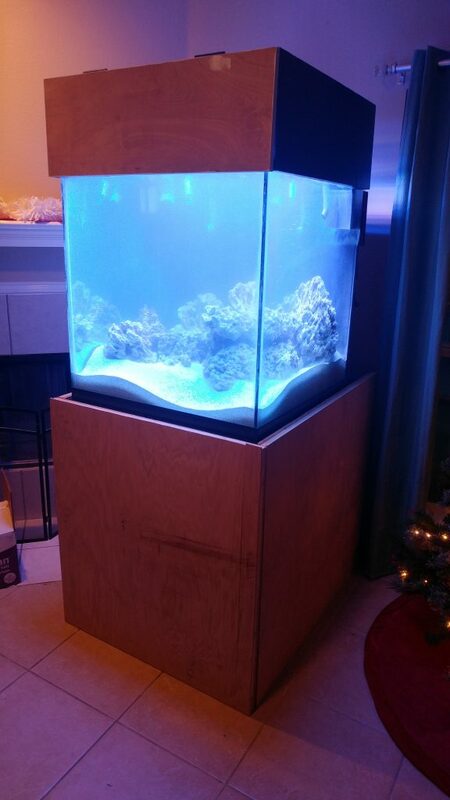 I still needed something to house the top-off water, so I did some measuring and found out that 10 gallon aquarium would fit perfect on the side of the stand. I went and picked one up after work on Thursday. I got home last night and started filling up the storage containers with bleach water to sterilize them. As they started filling up, I noticed a dripping sound. Sure enough, some of the bungs on the bottom of the containers are leaking. I didn’t bother putting teflon tape on them because it looked like they had gaskets. Looks like I’ll be going back and adding teflon tape to all of them now. We’re getting very very close to getting water in this thing! The tank is on the stand inside the house and all of the stand work has been re-installed. 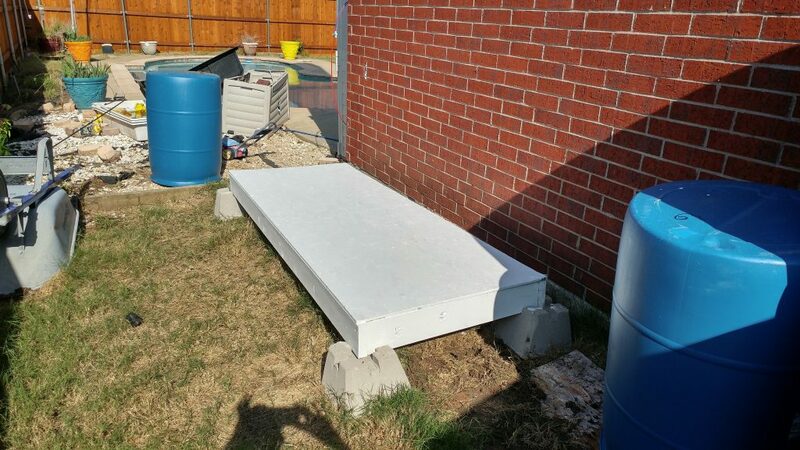 I got the platform built in the backyard for the water storage and got the fresh and saltwater storage plumbed. I ran out of 2x6s for the spacers for the waste water storage. 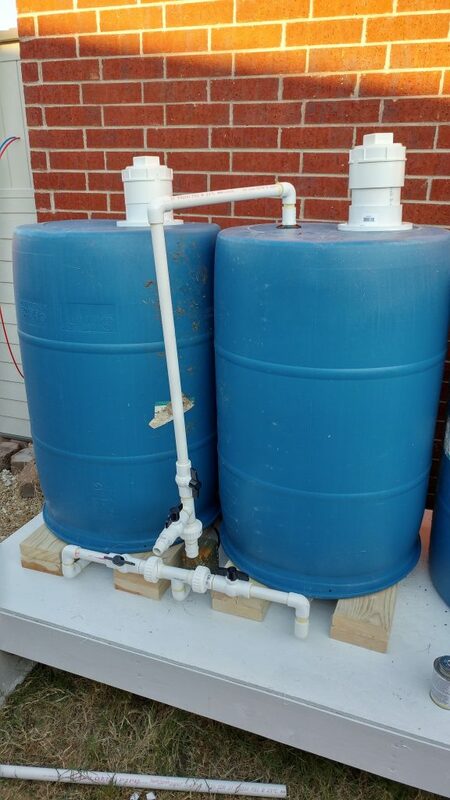 I need to rinse out the water storage and then I’m ready to start making the water for the tank. Finally, I got the canopy finished and got the first coat of paint on the inside of the canopy. I need to put a second coat of white on the inside and put two coats of black on the outside to finish the canopy. 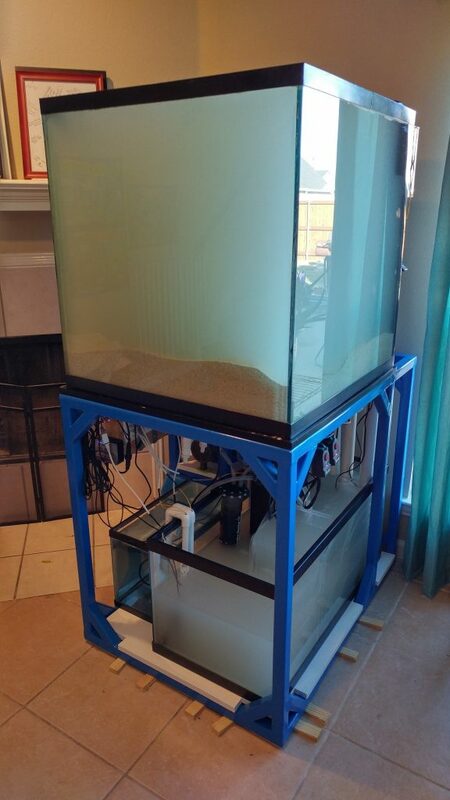 If everything goes smoothly this week, I should be able to start putting water in the tank next weekend. I was hoping to get water in the tank mid-week, but the wife is going out of town so it’s just me and the two munchkins. 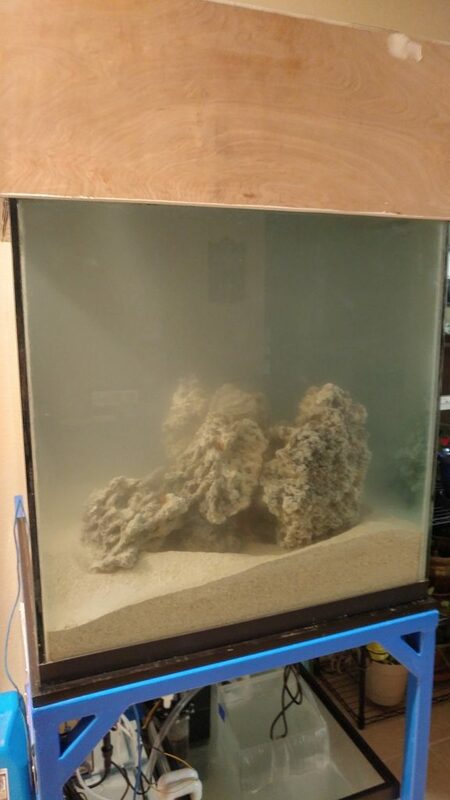 Finally got a bit more work done on the tank. I painted the PVC pipe that goes up the back of the tank. I also got the back of the tank painted. The stand is in the house and most of the equipment has been installed. The plan is to get the tank on the stand this weekend and get the canopy finished. 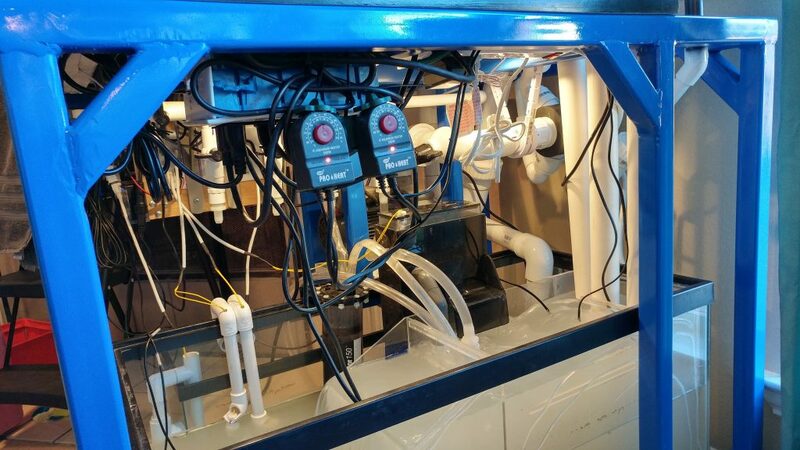 I want to get some water in the system, but I need to get the water storage finished so I can start making some pure water. I know my wife will be happy to finally get all the stuff out of the garage so she can get her car back in it.